As experts in curtain tracks and drapery hardware, we are pretty fond of windows of all kinds. One of our favorites is the bay window, but many people don’t know the bay window’s dark secret: a Bay Window is not actually one window, but three or five separate individual windows arranged in a semicircle. This makes them very hard to dress with rods, as each section needs its own rod and brackets. 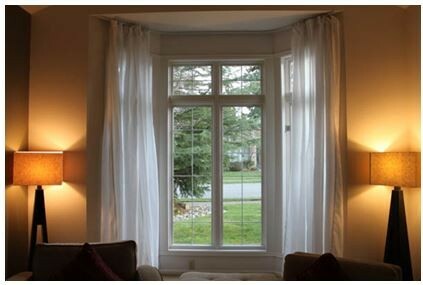 Curtain tracks are much simpler and more effective at covering a Bay window (or should we say windows? 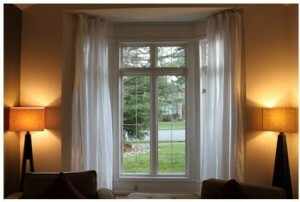 ), and with the right track, curtains can be moved seamlessly along the whole, curved length of the window(s). This track uses 6111 Flexible Curtain Track carriers, and the brackets and cartridges do not interfere with the movement of the carriers, so your curtain can move smoothly from one end of the bay window to the other with no stops or catches. How you will attach the curtain to the carriers depends on the curtain itself. Curtain panels with pleats will need drapery hooks, but those with grommets will need steel curtain hooks. Lastly, we can’t express enough the importance of purchasing end stops (you will only need two!). Have you outfitted your Bay window with our flexible track? Send us some photos at info@curtain-tracks.com.